How Did We Get Into This Mess? : Girls Read Comics Too! 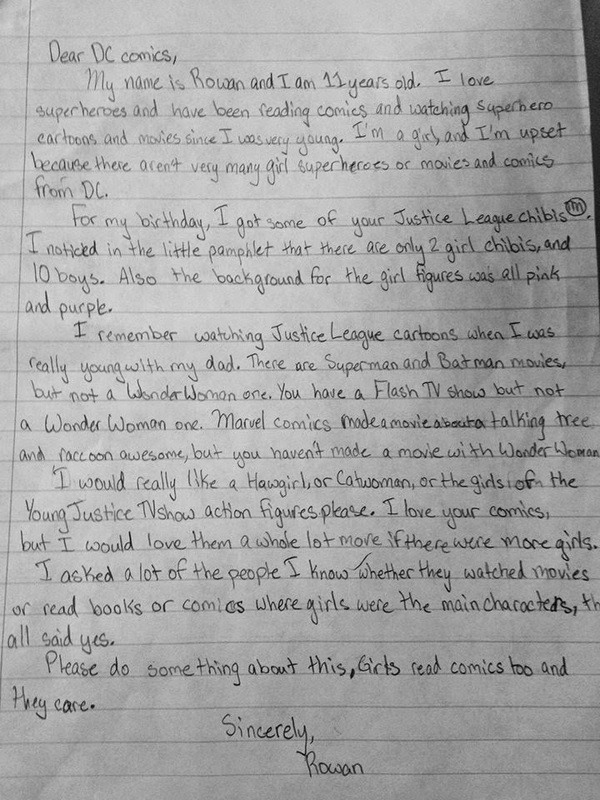 An Awesome Letter from Rowan, Age 11, to DC Comics. Girls Read Comics Too! An Awesome Letter from Rowan, Age 11, to DC Comics. Marvel comics made a movie about a talking tree and a raccoon awesome, but you haven't made a movie with Wonder Woman. Girls read comics too and they care. Rowan is an 11 year old girl. I know her and her parents and am posting this with all of their permission (especially Rowan's). She loves comics and she wrote this letter to DC Comics. I love this and hope DC listens. I've written about my own daughter's love of comics here and here, and hope Rowan helps make comics a little more girl-friendly (and less pink and purple). If anyone at DC (or anyone else) would like to contact Rowan, I'll be glad to put you in touch with her family. My name is Rowan and I am 11 years old. I love superheroes and have been reading comics and watching superhero cartoons and movies since I was very young. I’m a girl, and I’m upset because there aren’t very many girl superheroes or movies and comics from DC. For my birthday, I got some of your Justice League Chibis™. I noticed in the little pamphlet that there are only 2 girl Chibis, and 10 boys. Also, the background for the girl figures was all pink and purple. I remember watching Justice League cartoons when I was really young with my dad. There are Superman and Batman movies, but not a Wonder Woman one. You have a Flash TV show, but not a Wonder Woman one. Marvel Comics made a movie about a talking tree and raccoon awesome, but you haven’t made a movie with Wonder Woman. I would really like a Hawkgirl or Catwoman or the girls of the Young Justice TV show action figures please. I love your comics, but I would love them a whole lot more, if there were more girls. I asked a lot of the people I know whether they watched movies or read books or comics where girls were the main characters, they all said yes. Please do something about this. Girls read comics too and they care. Girls do read comics and they do care. Now the question is, does DC care? Update: Yes I know Wonder Woman is coming. Rowan will be 13 by the time she gets to see her first movie with a female lead. Update 2: Reprints of the letter are welcome. Please link to this page and send me a note, just so I can keep track. Down Syndrome is "Hell on Earth." Academics: Say Nothing if you Want a Job.